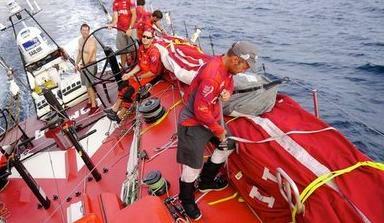 It’s day eight and we have just cleared the last turning mark off Singapore before heading north to Sanya. I have just come down below for dinner after being on deck for eight hours and I’m about to head back out for another four hour watch. Such is the nature of racing the Volvo especially around a port as in the busiest Singapore straits. The past few days sailing down the Malacca straits have been very challenging in so many different ways, aside from the obvious sailing challenges, and dealing with light and fickle wind and strong currents. We also had numerous encounters with local fisherman, causing us to often make very wide deviations off course, otherwise we would have caught and tangle in their nets. Some of these nets were almost impossible during the day and I can only guess how many close calls we had during the hours of darkness. Life on board was particularly challenging temperatures in the high 40s down below and any simple task was accompanied by stream of glistening sweat running off your body. Today I treated myself to a clean pair of undies and a clean shirt, my first change since the start over a week ago, so you can imagine what state they are in. I think I need a hazardous waste sticker on my gear bag, or at least will have to drop them off in the agricultural waste bin when I re-enter New Zealand. So with about 1,100 miles of upwind work to payout until Sanya, there is still plenty to play for with only 25 miles separating the first five boats.